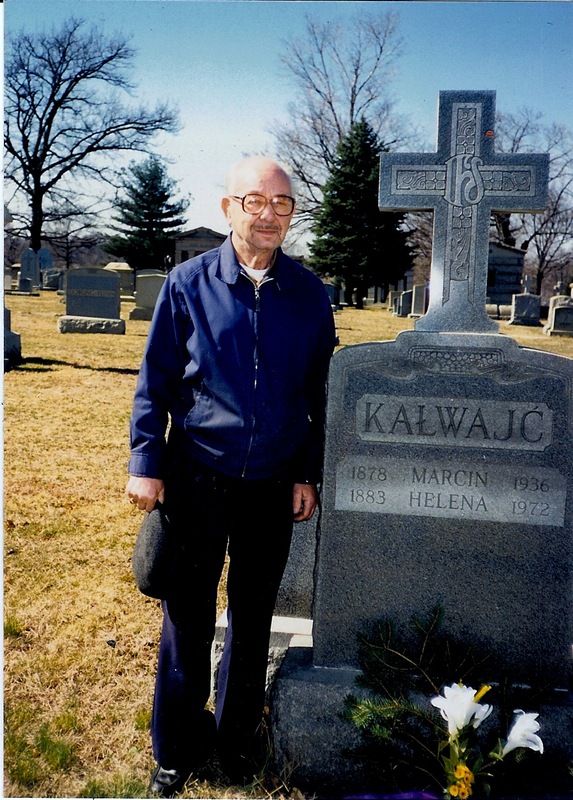 Greetings to all Kalwaic family members! You have an exciting family lineage! To enlarge the pictures and illustrations, increase font about two sizes/or use the zoom function in view menu in your browser. Click on images to view in larger size. And I do mean the beginning. Richard submitted his DNA to the National Geographic Genome Project and received his results in January 2010. He selected the Y chromosome so his ancestors would be traced from the male line, which belongs to the Haplogroup N (M231). Map below shows the migration. Your ancestral history stretches back about 50,000 years to the first common marker of all non-African men, M168. His descendants became the only lineage to survive outside of Africa. He probably lived in northeast Africa in the region of the Rift Valley, Ethiopia, Kenya or Tanzania. The exodus from Africa was most likely due to climate change. The next male ancestry is the man who gave rise to M89, a marker found in 90-95% of all non-African. He was born about 45,00 years ago in Northern African or Middle East. Many descendants of M89 remained in that area, but some followed the herds of animals including wooly mammoths into Iran and to the steppes of Central Asia. A man born around 40,000 years ago in Central Asia, gave rise to the marker known as M9. This was the Eurasian Clan and followed the herds eastward until the path was block by the massive mountain ranges of south Central Asia including the Himalayas. Where the three mountain ranges meet in the area know as the “Pamir Knot” in Tajikistan, the tribes split into two groups. Some moved north into Central Asia while other moved south into the Indian subcontinent. About 35,000 years ago the first hunter-gathers moved into Asia. Most of these first migrant descended from the M9 genetic line. 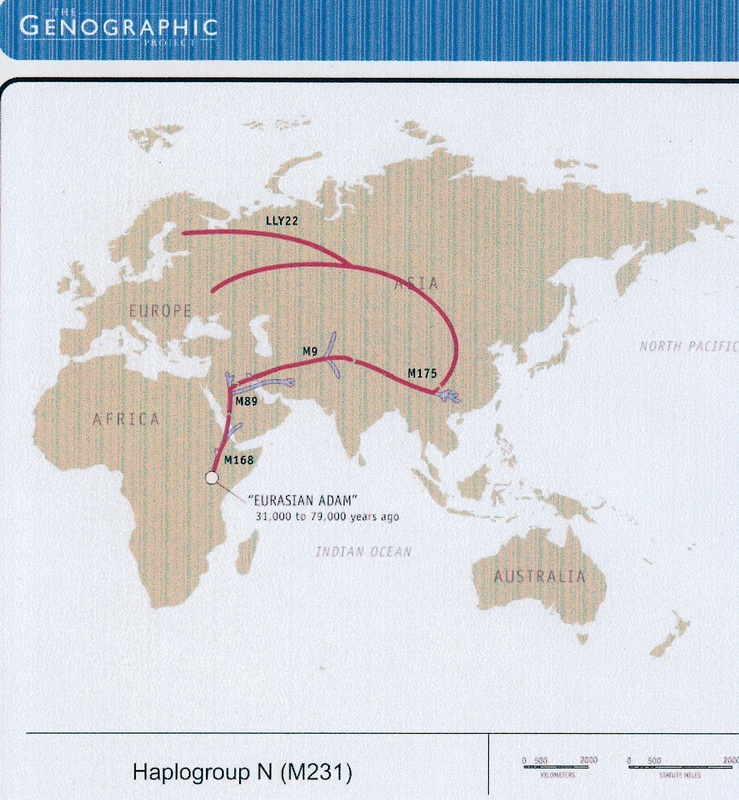 Once there, several distinct Haplogroups formed, one of which share a common ancestor known as M214. He lived east of the Aral Sea. His descendants gave rise to a Haplogroup called NO. The 231 marker and the M175 marker are found in high frequency throughout North and East Eurasia. Ironically, the ancestral NO group is very rare in today’s populations, found only sparingly along the north and eastern fringes of China. One of the men in a group of Eurasian Clan people who traveled north through the Pamir Knot region gave rise to the M231 marker, which defines your lineage. He was probably born in Siberia within the last 10,000 years. His descendents trace a migration of Uralic-speaking people during the last several thousand years, the lineage now found in southern parts of Scandinavia and well as northeast Eurasia. Many Russians from the far north are members of haplogroup N. The Saami, an indigenous people of Scandinavia and Russia, followed the reindeer herds. There may be as few as 85,000 left today. Click on the tab, Atlas of Human History, and then in the space in front of 50,000, press the Zoom In. Run the cursor over the map on the Blue Route until M168 appears. Click on it and the detailed description of M168 appears. Follow the same directions for finding the other markers and explanations. Back on the main road again we continued to Vistytis (or Wisztyniec in Polish) a town in Lithuania. In this village there is a white wall and electric fence separating Russia and Lithuania. Zenon explained to me the history of this area….many times today. This area was affected by many wars, conflicts, changing of borders etc. 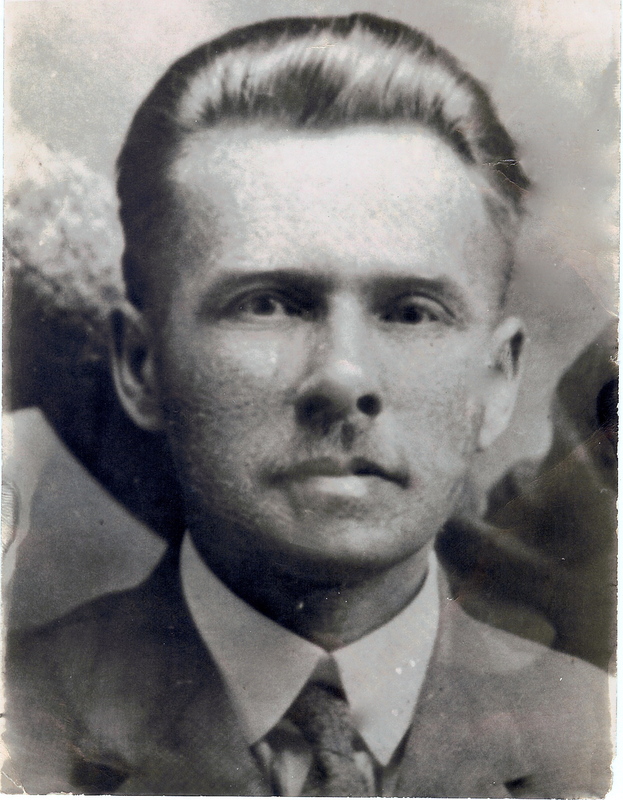 During the Holocaust all of Vištytis’ Jews were murdered, mainly by local collaborators in the town. The exact number murdered is unclear; estimates range from 200 – 400 Jews (out of the town’s general population of around 1000). First the men were shot, then the women – but, to save bullets, the Jewish children were killed by having their heads bashed against the trees in the town park. A memorial to the victims was later erected by the Soviets near a windmill called Grist Mill, but the plaque made no mention that those buried in the nearby fields were Jews. Later, a ‘Jewish’ tombstone was erected that clearly noted what happened. 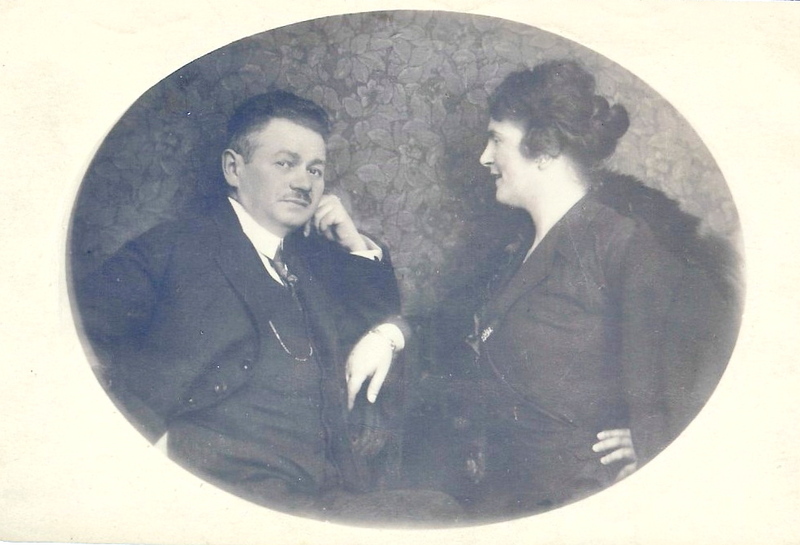 One family mystery remains: many Polish were prejudiced against the Jews, and given that Marien must have experienced that prejudice in his birthplace, he married a Jewish girl, even if she was a convert. Kalwaic derived from the Polish name Kalwajc, which came from the Lithuanian name Kalvaitis (Lithuanian names often end in tis). It would certainly seem reasonable that his family would have the M231 marker. Marein, who attended schools in Russia, received encouragement from his father to pursue a musical career as both his uncle and father were were church organists. He became a student at the Russian Czar’s Royal Conservatory of Music in Moscow where he studied music and played first trumpet in the Czar’s orchestra. Between the years 1868 and 1914, 20% of the Lithuanian people left their country. In 1868 famine plagued the country. 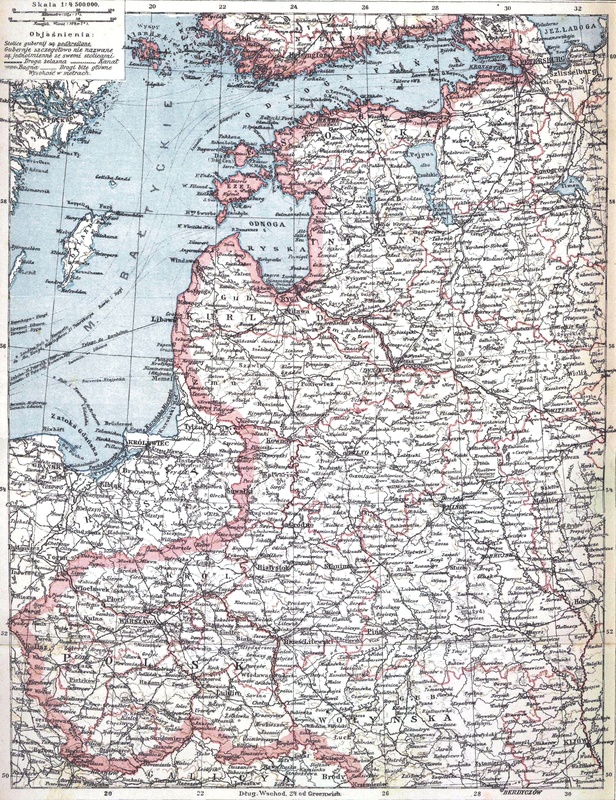 Poland had been partitioned in 1815, with Austria controlling one section and Russia dominating the eastern section. The Czars reduced Polish freedoms and basically annexed the country. In January and February of 1905 a revolution broke out, and in June of that year Polish workers staged an uprising in Lodz. 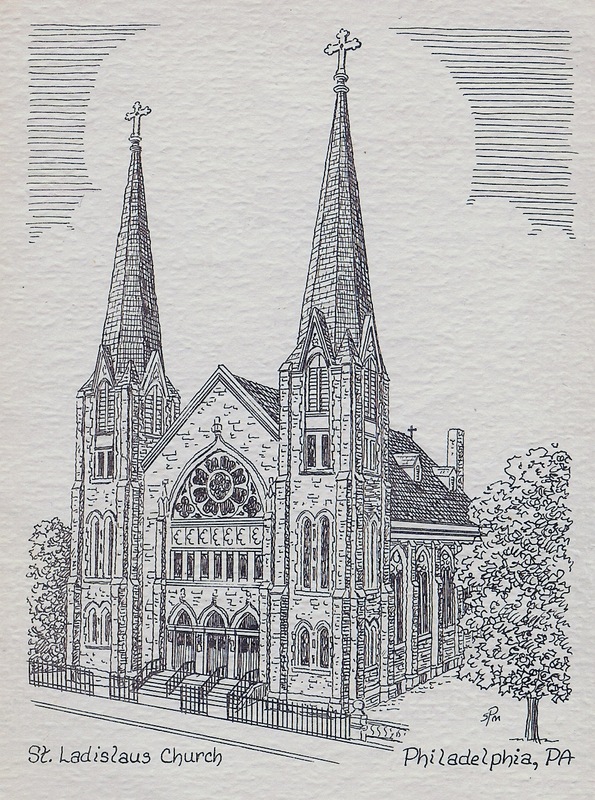 In 1905 Martin emigrated to the United States, leaving from Antwerp, Belgium, on the SS Finland, being promised a position as church organist to a newly organized parish in North Philadelphia, St. Ladislaus. 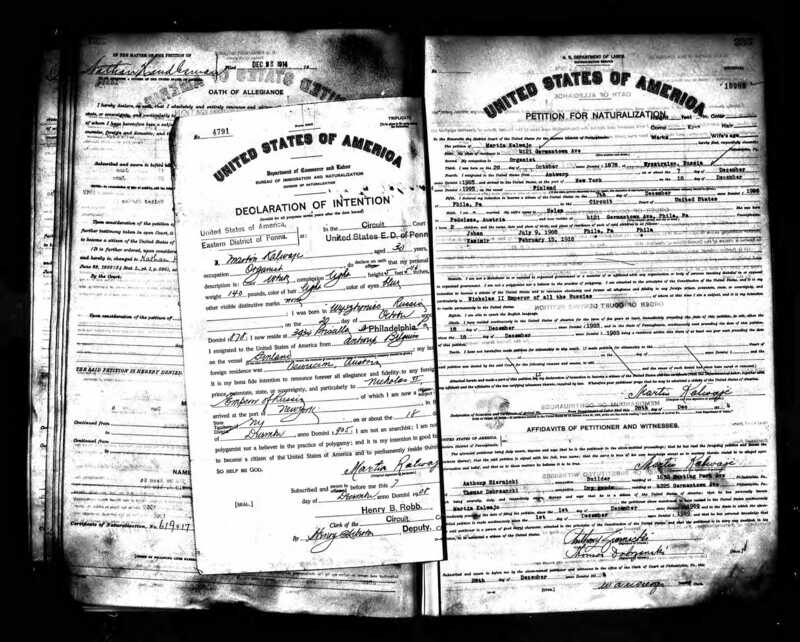 In 1915 he became a US citizen. Martin founded the choir in 1906, one of the first groups to be organized in the parish. In the Diamond Jubilee Book 1906-1981, Martin is described as “accomplished musician and served as a organist and choir director until 1936.” His son John succeeded him and stayed until 1956. In the years following, John assisted the full-time organist. Martin (first row, center) is pictured below as director of St Cecella’s Choir, 1931. Map below shows the birthplaces of Martin and Helen. 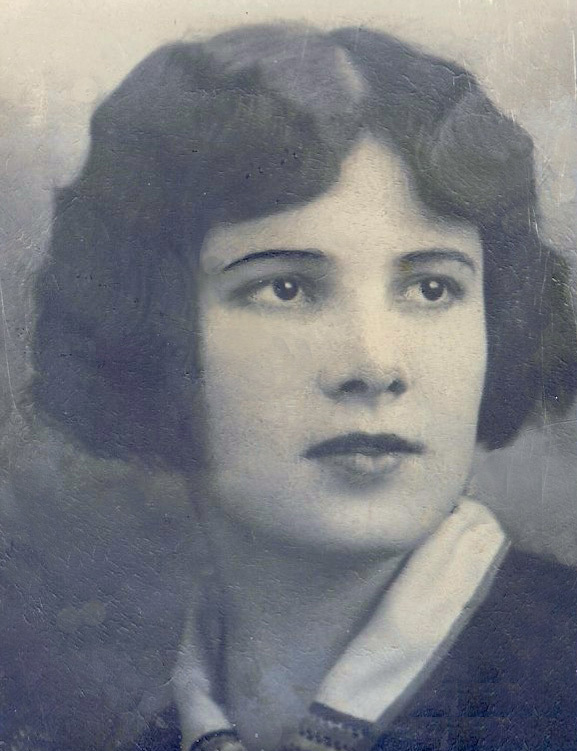 Helen was born into a Jewish family near Krakow, Poland, on June 12, 1883, in what at that time was part of Austria. According to Martin’s emigration application, she was born in a small village on the Wisla River: Podl-eze, about 11 miles outside of Krakow. Her father’s name was Jacob; names of siblings: Harry G, Jacob, Rose (Farren), Leon Israel, Anna (Graoth), Gusti (Mandelbaum). She attended schools in Krakow studying both the Polish and German languages. Her mother passed away when she was 12 years old. Since the family was large, she was sent to live with her grandparents. 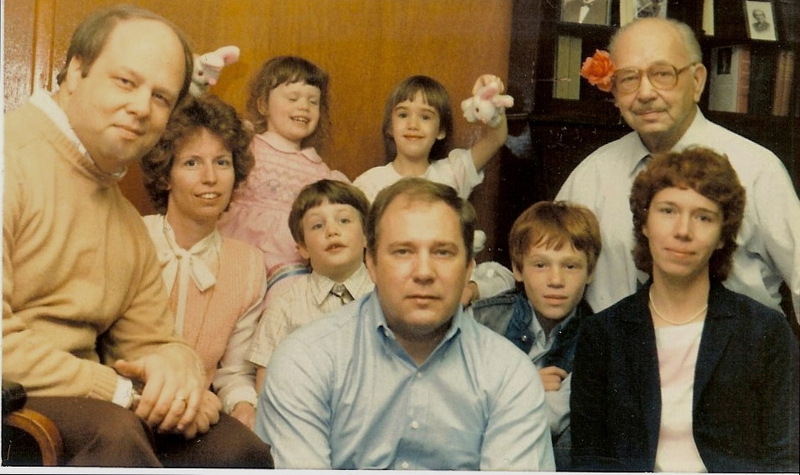 According to our family oral history, Helen was sent to a convent, but we are uncertain why. Life for those of the Jewish faith was difficult. When Tsar Alexander II was assassinated, the Jews were falsely blamed which prompted anti-Jewish riots, called pogroms, from 1881 to 1884. From that time until 1920 two million Jews immigrated to the United States. While at the convent, Helena learned the seamstress trade and began to sew habits for the Sisters of Nazareth in Krakow. Franciszka Siedliska, a wealthy Polish woman, established The Sisters of Nazareth in Rome in 1875 and opened a house in Krakow in 1881. Helen lived at the convent with the sisters for a several years as an associate worker. Between 1903 to 1906 the polgroms, probably supported and organized by the Russian secret police, grew worse in the Polish territories. At some point Helen converted to Catholicism–whether it was because of the kindness of the nuns, or meeting Martin, or for practical reasons, we can only speculate what might have been her motivation. Helen and Martin met at religious services and formed a relationship. Martin’s last place of residence was Bobrek, Poland, located about 30 miles from Krakow. 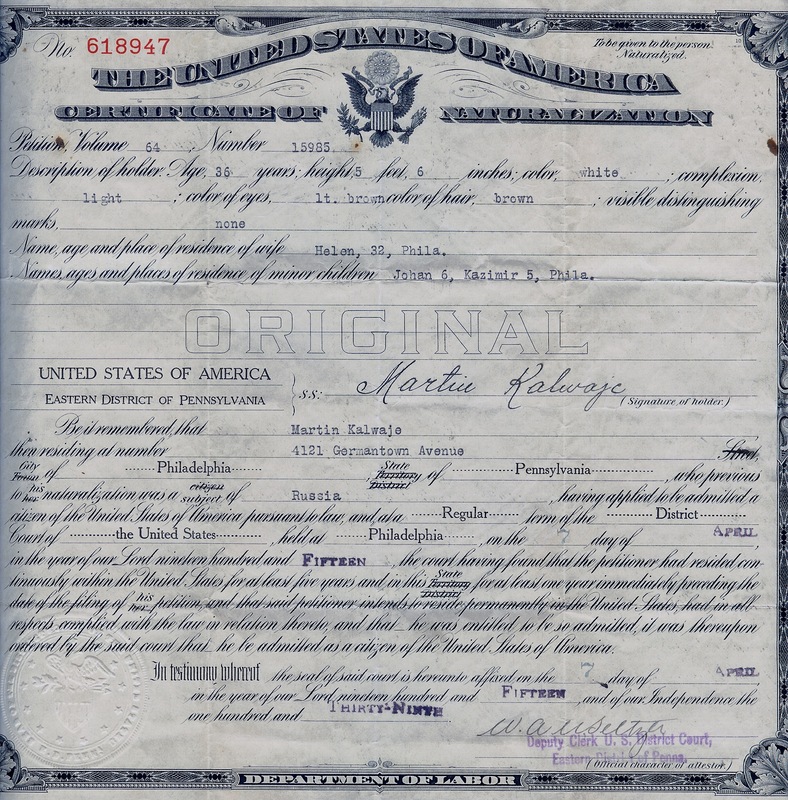 Helen followed Martin and emigrated to the United States in October of 1906. 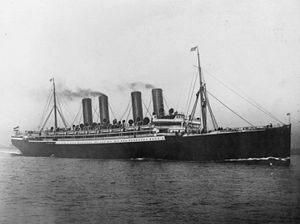 She left Bremen, Germany, on the Kaiser Wilhelm Der Grosse, a ship that would eventually become famous for the first passenger ship sunk in World War I. Helena listed “tailor” as her occupation, “German” as her nationality, and New York, Sisters of Charity, as her destination. She listed her birthplace as Galicy, which was a region in Poland. It seemed that she might have traveled with another young woman, Salia Fliegdmann, who was also from Galicy. She joined the convent of the Nazareth sisters at Port Richmond continuing her work as a seamstress. Martin and Helen were married on November 13, 1906, most likely in the “Old Oaks Mansion,” which served as the place of worship until the church was built on Hunting Park Avenue. 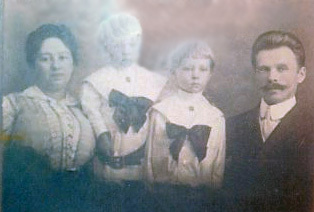 Their first child, John, was born in 1908, Charles in 1910, and Henry in 1918. Henry was the first of their children to be christened in the new gothic church, finished in February of 1916. Music was central in the boy’s lives; all learned to sing and play the piano, John also played the violin. 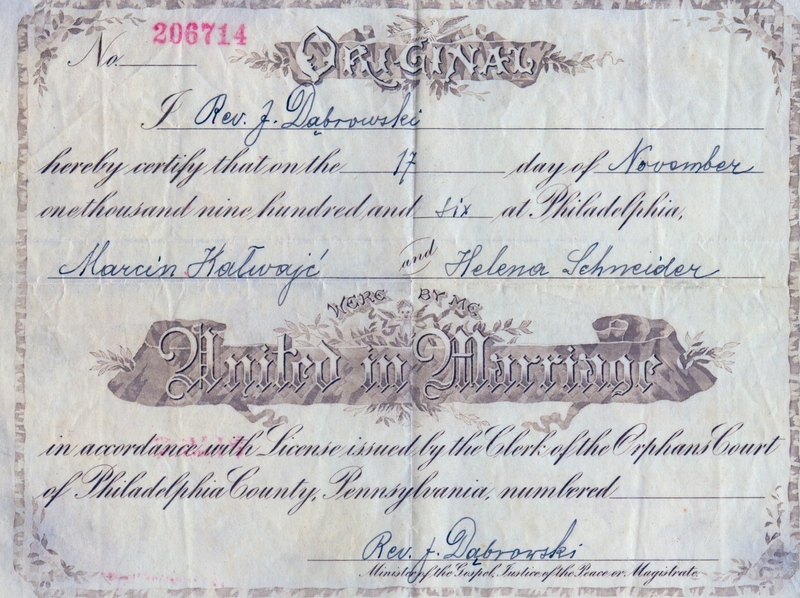 Since the church compensation was insufficient to provide for the family, Helen coaxed Martin into starting a business in a store on Germantown Avenue in Philadelphia. They sold religious articles and expanded by selling musical merchandise and whatever they thought the budding Polish immigrants would buy, including radios. Their business was so successful that they built a new store and added a furniture section. 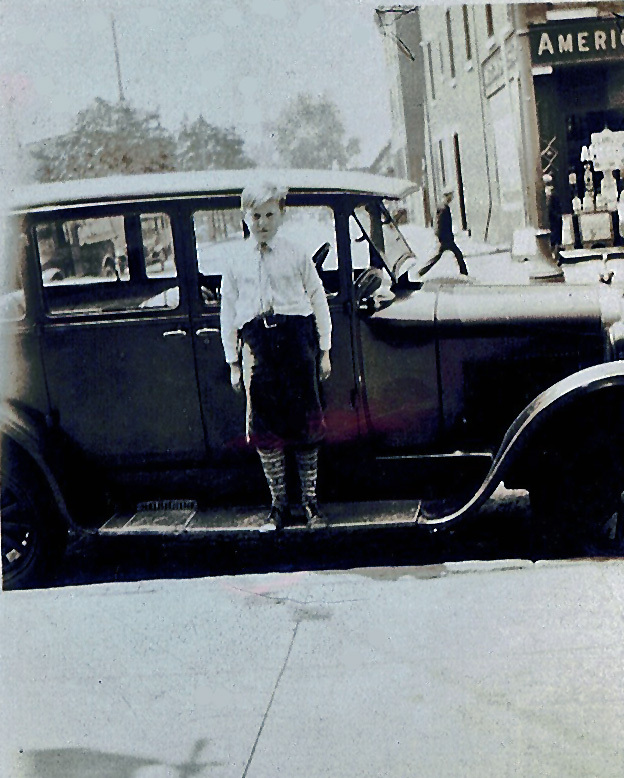 According to the 1920 census, the family lived at 4203 Germantown Avenue. Martin continued as organist and choir director. Martin developed ulcers and passed away in 1936. Helen had brothers and sisters, and Leo also immigrated to the United States and lived in New York City. No information about Leo in family oral history. 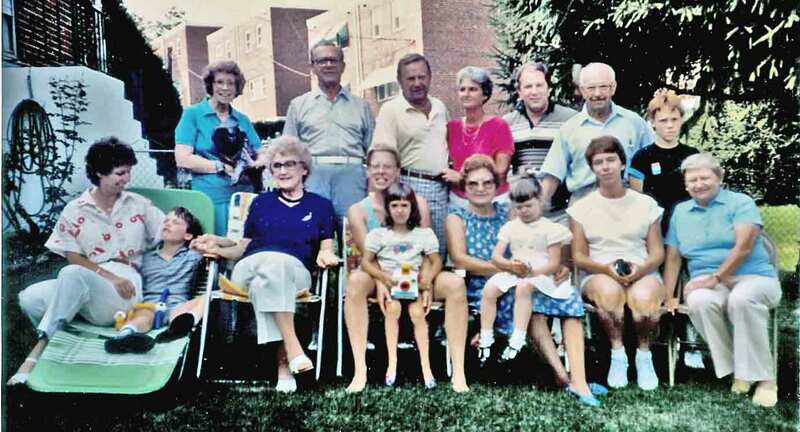 Another pictures in the album shows a picture of Helen’s cousins, Beverly Ann and Billy David, but have no information as to where they fit in her family tree. 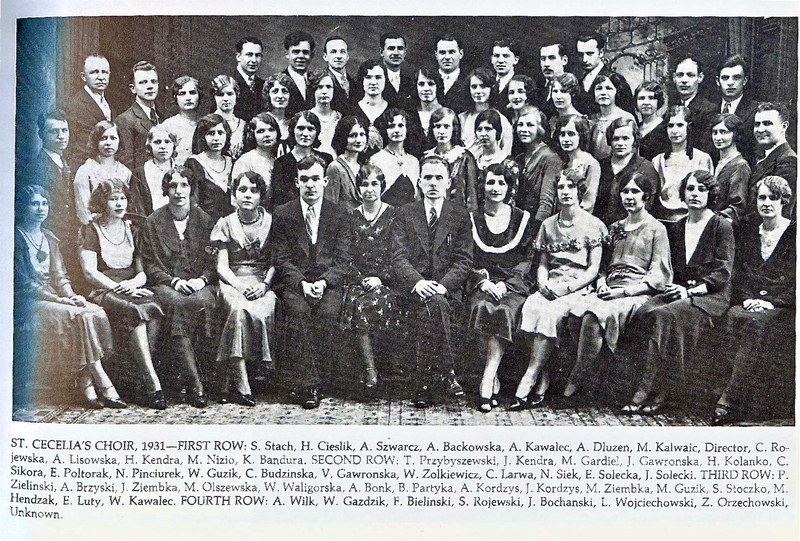 In 1921 Helen was elected first president of the Union of Polish Women in America. 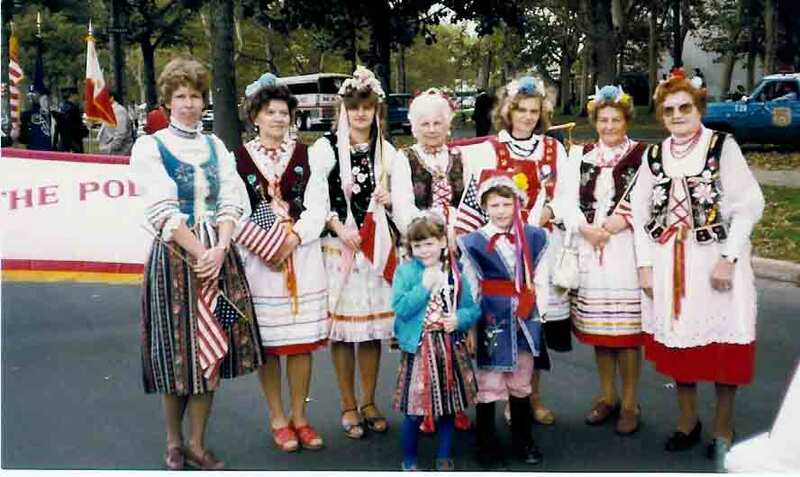 The primary purpose of their organization was to assist the newly created country of Poland, as well helping those persons of Polish heritage living in the United States. The group started with 19 members and grew to over 700. She remained active in the organization for most of her life. Helen continued to run the family business for several years after Martin passed away, then sold the store. In 1966 she entered the St. Joseph Home for the Aged. She passed away in 1972. On July 9, 1908, John Joseph was born and then baptized in August of that same year. (Peeking out from behind his dress is a Polish doll.) John attended St. Ladilaus Elementary School and went on to Germantown High School. He graduated from the University of Pennsylvania with a Bachelor of Science in Economics and then earned his Master’s degree in Education at Temple University. John was a business teacher for 31 years for the Pottstown School District. He also was organist and choir director for St. Ladislaus as well as for other churches. He played violin with the Pottstown Symphony Orchestra. In 1941 John married Feliska Goreki. They had two sons. Charles, who they called Kazmir, was born two years later. Like John, he was given musical instruction from an early age and was taught to play the piano. 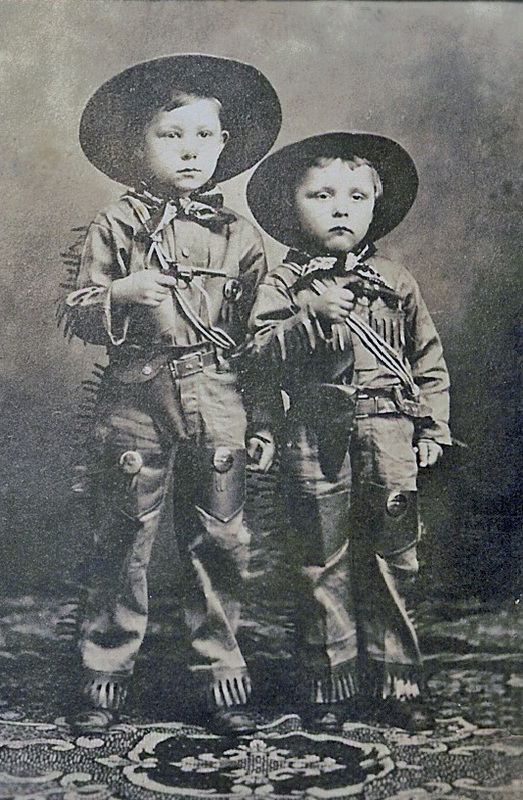 The picture below is John and Charles circa 1914. After high school, Charles worked at Sears then entered the army earning the rank of sergeant and was stationed in France during World War II. He was a radio operator. During his later years, he and his wife, Mary, operated a motel, Mardon Court, at 5200 Ocean Avenue at Bennett in North Wildwood, New Jersey. 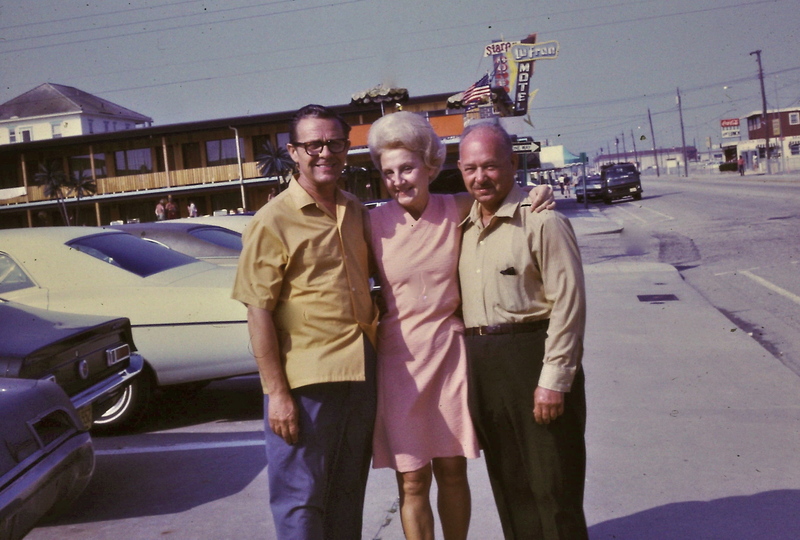 Photograph below, taken in 1971, is with Charles, Mary and John standing at the street in front of their motel. 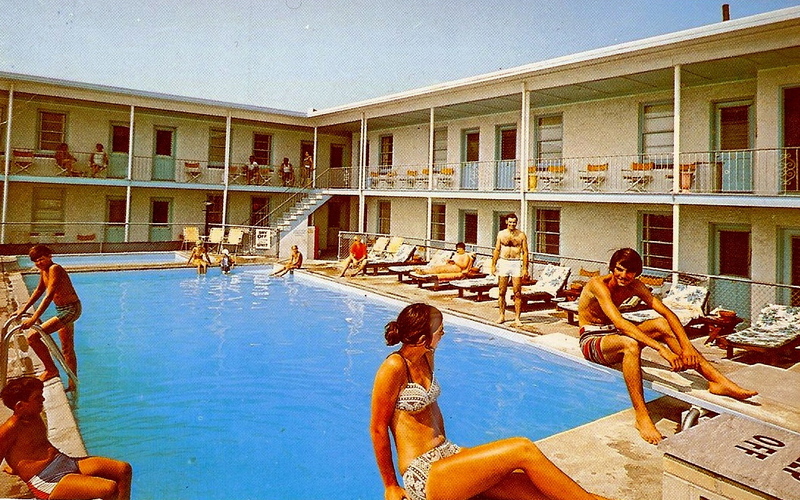 Below the picture is a postcard of their motel. Henry was born in 1918. After high school he attended Temple University where he received his degree in dentistry. He served in Patton’s army during World War II. He and his wife, Martha, had three children, Karen, Henry Charles and Henry Jr. (Toby). 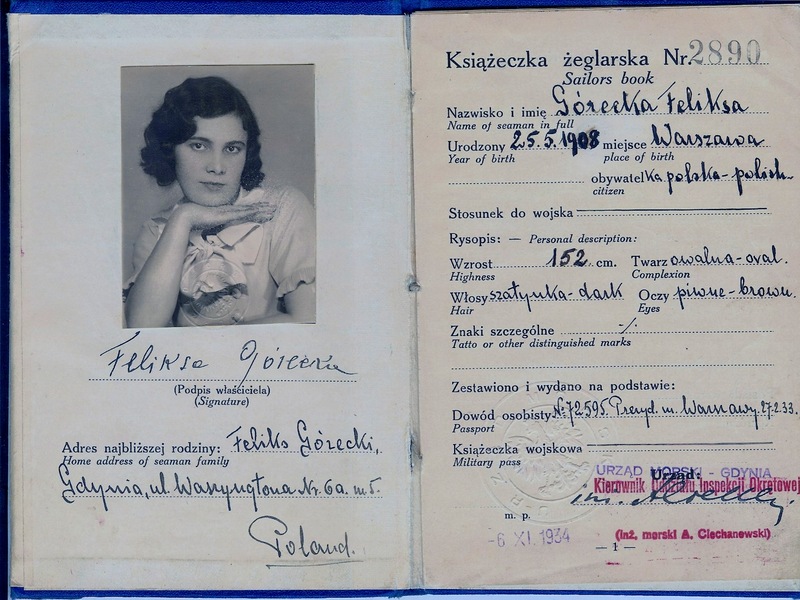 Feliksa was born in Warsaw, Poland, on May 25, 1908, daughter of a tug boat captain, Felix Gorecki. First she worked on the S/S Pulaski beginning in 1935, but in May 1936 took a position in the gift shop on the M/S Batory, an ocean liner of the Polish merchant fleet. 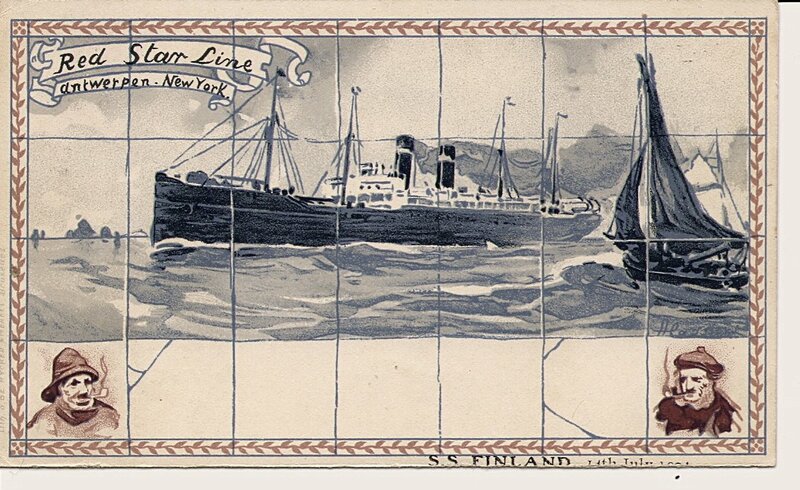 At the outbreak of World War II, the Batory was mobilized as a transport ship, stranding Lucy in New York City. Her date of discharged on her Sailors Book was September 22, 1939. She was introduced to John through a mutual friend. 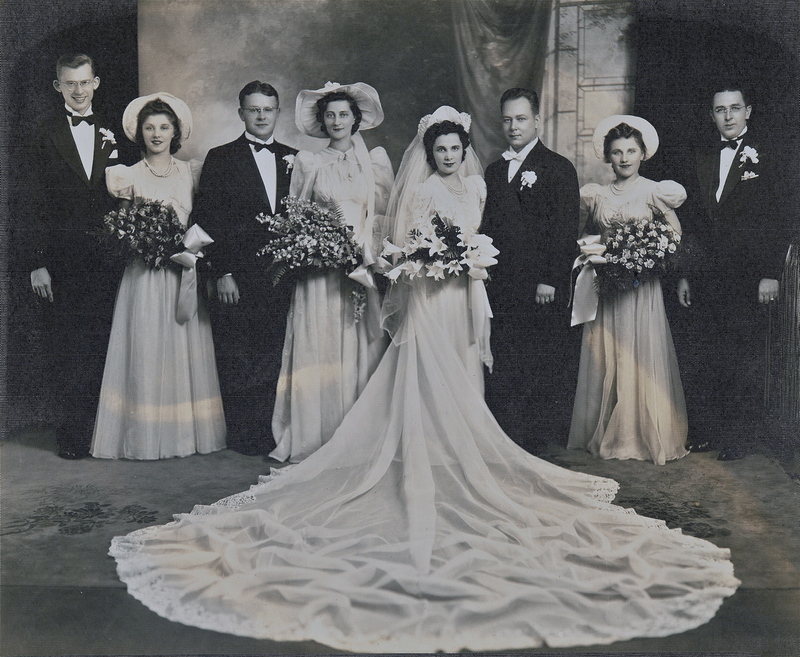 Below is a photograph of John and Feliska’s wedding. 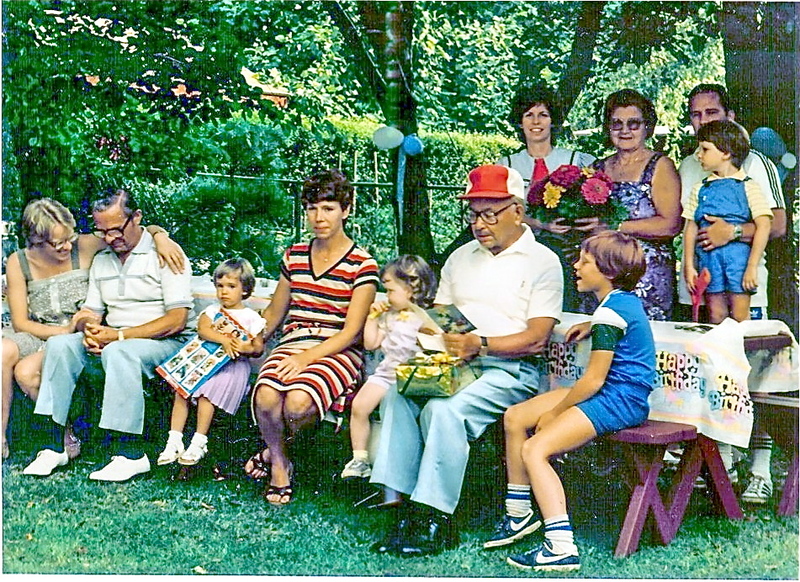 From left to right: Charles, Mary, Henry, unknown, Feliska, John, and two unidentified persons. The couple eventually settled in Philadelphia. Lucy’s ties to Poland were always strong, and she often sent packages back to family in Poland. Lucy passed away on August 29, 1970, after a long illness, and is buried in St. Aloysius New Cemetery in Pottstown. 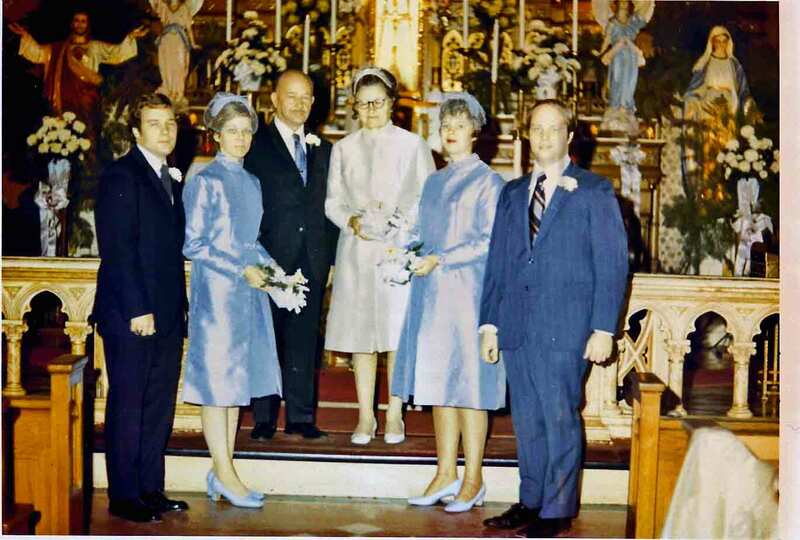 In November of 1971 John married for a second time to Aniela Oleskszyk Dziwura–Angela. Both John and Angela remained devoted to St. Ladislaus, participating in many of the Church activities. Angela knew John’s mother from the Union of Polish Women, an organization in which they both served as president. The Pennsylvania Historical Society has a record of Angela donating manuscripts from the American Relief for Poland, Philadelphia Chapter. Angela was an excellent cook and seamstress, making costumes for John’s grandchildren for the Pulaski Day Parade held every October in Philadelphia. The final resting place for Martin, Helen, John and Angela, is at the Holy Sepulchre Cemetery on Cheltenham Avenue in Philadelphia. (Lot 23, Section P, Range 26) With the passing of John and Angela, this was also the end of the era for their beloved St. Ladislaus Church. The Polish population membership fell drastically between 1997-2001, and so the parish closed in 2003. By 2004 the Church was demolished making way for a new facility for the new owners, the Triumph Baptist Church. St. Ladislaus did not have historic preservation status, and no one objected to the demolition. Very interesting, seems like the church choir and music interests have gone back a long way. Thanks for all the work you did on this Kae. There are many more documents and pictures to go through to update the page. Hopefully, at some point I will add more content. Appreciate any and all comments! So much amazing family history here! And DNA certainly gives ancestry search a whole other dimension! And the photos are priceless. Doing a blog page on family history was a great device to put the story together . . . before doing the page, what we had were life segments without the context or flow. Seems like each photograph has its own story, too.